The Twins have released first baseman/outfielder Brock Stassi, per Mike Berardino of the St. Paul Pioneer-Press (via Twitter). His roster spot at Triple-A Rochester will got to just-acquired slugger Chris Carter. Stassi, 28, crafted a nice story when he earned a roster spot out of camp with the Phillies last year. But he failed to succeed in his first crack at the big leagues, slashing just .167/.278/.295 in his ninety plate appearances. On the positive side, Stassi drew a dozen walks to go with his 22 strikeouts. The left-handed hitter had wielded quite a productive bat in the upper minors prior to his first taste of the majors. But he fell off badly upon returning to Triple-A last year and has carried that poor performance into 2018. Since signing on with the Minnesota organization, Stassi carries only a .211/.316/.316 slash in 133 plate appearances at the highest level of the minors. The Pirates announced that they’ve signed outfielder Todd Cunningham and right-hander Richard Rodriguez to minor league contracts with invitations to Major League Spring Training. Cunningham, 29 in March, has just a .520 OPS in 130 MLB plate appearances but batted .284/.404/.414 in 358 Triple-A plate appearances between the Cardinals and Dodgers last season. He’s never hit for much power but has long posted quality on-base numbers in Triple-A. Rodriguez, meanwhile, made his big league debut with the Orioles last year but was rocked for nine runs in 5 2/3 innings. But, the 27-year-old comes to the Bucs with a career 2.70 ERA, 8.7 K/9 and 2.6 BB/9 in 243 Triple-A innings between the Orioles and Astros. The Twins have signed infielders Brock Stassi, Gregorio Petit and Leonardo Reginatto to minor league deals, tweets MLB.com’s Rhett Bollinger. Stassi, 28, made his big league debut with the Phillies last season, totaling 90 PAs with a .167/.278/.295 batting line and a pair of homers. The first baseman/corner outfielder has a lifetime .261/.354/.407 slash in 638 Triple-A PAs. Petit, 33 this weekend, has a .643 OPS in 426 PAs across parts of five big league seasons and can play second base, shortstop or third base. He’s a .267/.317/.370 hitter in parts of 10 Triple-A seasons. As for Reginatto, the Brazilian-born infielder will return to the Twins for a third season after hitting .303/.369/.390 in a utility role with the Twins’ Triple-A affiliate in 2017. The Indians have signed 16-year-old Cuban right-hander Roberto Hernandez to a deal with a $320K bonus, Baseball America’s Ben Badler reports. Hernandez wasn’t included within MLB.com’s top 30 or BA’s top 50 rankings of 2017-18 international prospects, though Badler describes the righty as “one of the better” arms available in the July 2 class. Cleveland had an international spending pool of $5.75MM to work with in this signing period, and $3.825MM has already been accounted for by the team’s signings of youngsters George Valera, Aaron Bracho, Jose Tena and Wilfi Peralta. The Phillies announced that they have outrighted first baseman Brock Stassi to Triple-A Lehigh Valley. Stassi lost his spot on the Phillies’ 40-man roster when they claimed reliever Juan Nicasio off waivers from the Pirates on Thursday. Prior to his designation for assignment, the 28-year-old Stassi batted just .167/.278/.295 in his first major league action (90 plate appearances). Stassi has been better – albeit not great – at Triple-A this year, having hit .256/.328/.354 in 186 PAs. The Rangers have outrighted right-hander Anthony Bass to Triple-A Round Rock, executive vice president of communications John Blake tweets. Texas designated Bass on Thursday when it acquired righty Miguel Gonzalez from the White Sox. Bass’ most recent extensive big league action came during a 64-inning campaign with the Rangers in 2015, when he pitched to a 4.50 ERA. He has made two appearances with the Rangers this season, but his work has otherwise come at Triple-A, where the 29-year-old has put up a 4.18 ERA with 10.39 K/9 and 3.35 BB/9 in 75 1/3 frames. 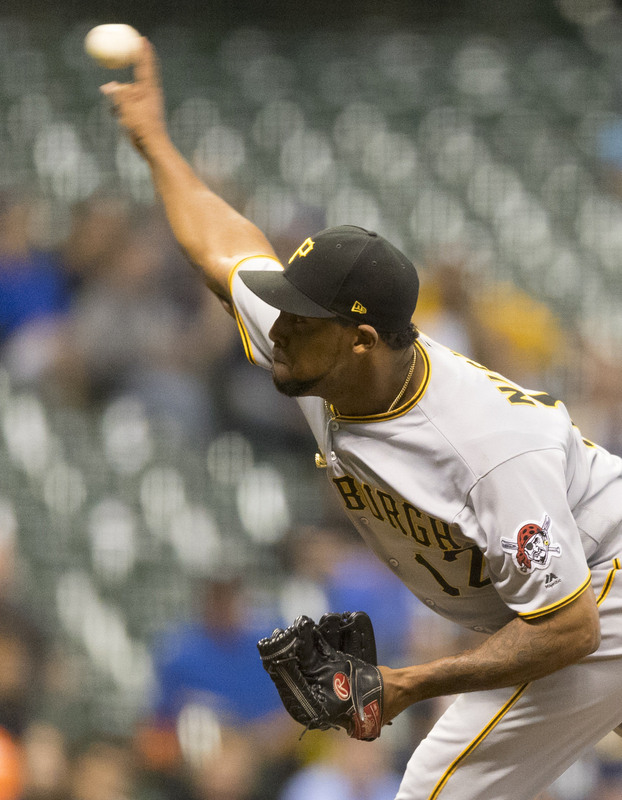 The Phillies announced that they’ve claimed right-handed reliever Juan Nicasio off waivers from the Pirates. Philadelphia designated first baseman/outfielder Brock Stassi for assignment to clear a spot on the 40-man roster. Perhaps the Phils simply are willing to pay for Nicasio to help win some close ballgames over the final month of the season, though at this point the team is in position to earn the top 2018 draft pick (with the worst record in baseball — which also gave them the top waiver position). It also won’t hurt to have a veteran in the bullpen with so many young pitchers on the rosters. The cross-state rival Pirates, on the other hand, evidently saw an opportunity to save some payroll in what has turned into a lost season. GM Neal Huntington acknowledged as much, as Bill Brink of the Pittsburgh Post-Gazette (links to Twitter). Huntington also cited a desire not to “help a direct competitor” as well as to allow other hurlers a chance to pitch in the late innings. There’s little doubt that many contenders would have liked a shot at adding Nicasio down the stretch. He has thrown sixty excellent innings this year, working to a 2.85 ERA with a 60:18 K/BB ratio. Odds are, Nicasio will step into a late-inning role for the Phillies. So long as he maintains something like his current trajectory, the 30-year-old will likely be in line for a strong, multi-year contract over the winter. As for Stassi, the 27-year-old struggled in his first taste of the majors this year. Over 90 trips to the plate, he hit just .167/.278/.295 with a pair of long balls. He has also fallen off in the upper minors after two consecutive productive campaigns. The D-backs announced that they’ve selected the contract of right-handed reliever J.J. Hoover. He’ll fill the 40-man spot that was vacated earlier today when Christian Walker was sent outright to Triple-A. Hoover, 29, inked a minor league deal with the Snakes this offseason after spending parts of the past five seasons — the entirety of his Major League career — with the Reds. Hoover opened the 2016 season as Cincinnati’s closer but quickly lost that job and experienced a rapid decline that ultimately led to his outright off the 40-man roster. As recently as 2015, however, the righty tossed 64 1/3 innings of 2.94 ERA ball with 7.3 K/9 against 4.3 BB/9. Hoover will walk his fair share of batters (career 4.2 BB/9 rate), but he’s also punched out 240 hitters in 242 1/3 Major League frames. As a rather extreme fly-ball pitcher, he may find Chase Field more problematic than some pitchers, though he’s no stranger to homer-friendly parks, thanks to his time in Cincinnati. The Indians are set to select the contracts of infielders Yandy Diaz and Michael Martinez, per a club announcement. Diaz, 25, enjoyed a strong season split between Cleveland’s Double-A and Triple-A affiliates, hitting .318/.408/.446 with nine homers and 11 stolen bases. The third baseman/second baseman/outfielder was terrific in Spring Training, hitting .429/.529/.667 with a pair of homers and four doubles during Cactus League play. The 34-year-old Martinez, no stranger to the Indians organization after spending 59 games and the postseason with Cleveland last year, had a similarly strong Spring Training. The veteran utility man batted .357/.379/.536 in 21 spring contests. In parts of six big league seasons, Martinez is a .197/.241/.266 hitter. The final two spots on the Phillies’ bench have been won by the well-traveled Daniel Nava and veteran minor leaguer Brock Stassi, per Jim Salisbury of CSNPhilly.com (Twitter link). Nava hit .362/.455/.489 this spring and can serve as a backup to corner outfielders Michael Saunders and Howie Kendrick in the Phillies’ new-look outfield. He also has some experience at first base and could serve as a left-handed complement to Tommy Joseph at times, though the same could be said of the 27-year-old Stassi. A veteran of six minor league seasons and the older brother of Astros backstop Max Stassi, Brock Stasi was emotional in discussing what will be his MLB debut (Twitter video link via Philly Voice’s Ryan Lawrence). A former 33rd-round selection, Stassi reached Triple-A for the first time last season and hit .267/.369/.437 before posting an outstanding .333/.397/.702 batting line and six homers this spring. Righty Craig Stammen is back in the majors after being selected to the Padres’ 40-man, per a team announcement. The 33-year-old had long been a steady reliever for the Nationals before he required flexor tendon surgery early in the 2015 season. He didn’t earn a return last year after joining the Indians on a minors deal, but did show he was healthy in throwing 27 1/3 innings of 3.62 ERA ball. Stammen turned things up a notch this spring, allowing just a single earned run on nine hits and five walks over 11 2/3 innings, recording a dozen strikeouts along the way.